Check out this awesome guide to help you figure out what's what during Study Breaks! 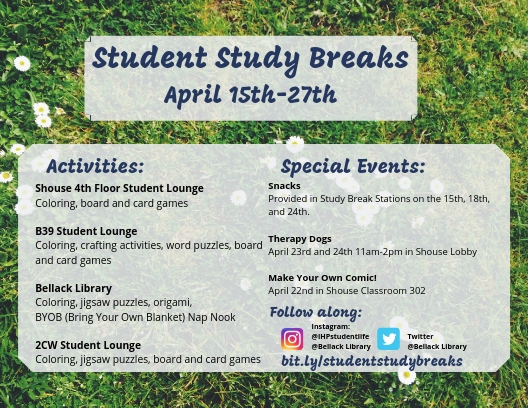 Study Breaks are put together by the Bellack Library, OSAS, and Operations at the end of each semester. This Spring semester's Study Breaks take place from April 15th until April 27th. Study Breaks are an opportunity for students to engage in healthy stress-busting activities around the IHP campus. Typically occurring before and during finals week of every fall & spring semester, Study Breaks are hosted by OSAS, The Bellack Library & IHP Operations. Activities are located in specific areas in the Library (B38), Student & Alumni Services (B39), Shouse (B36), and 2CW. Click on the tabs to your left to see what fun activities each location has to offer!